"Dear Chris, I really enjoyed what you wrote about my great great great grandfather, but I would like to put you right about the "four guardians" - they are Robert Coombes himself. Many thanks, Alison. Of course, identification would be much easier if the heads could be replaced - restoration of this great monument is long overdue. There is a similarly adulatory monument in Woolwich churchyard to Tom Cribb, Champion Pu gilist of England (1781-1848). 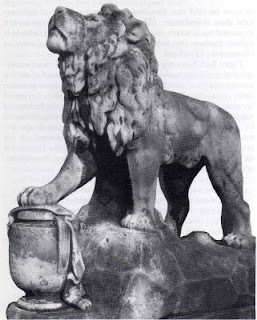 It is a stone lion with his paw resting on an urn, with the great boxer's championship belt draped over it. Cribb's funeral was one of the biggest ever seen in London. Both these monuments are relics of a time when sportsmen may have been worshipped but were actually proxies for noble patrons who could not compete in person for reasons of status and class. As soon as social attitudes changed and the upper classes could compete as long as they didn't do it for a living, amateur athletics displaced professional sport almost completely. The picture of Tom Cribb's lion comes from "The Black Diamond", Alan Bartlet's website devoted to the boxer. I suspect Cribb's grave overlooks the site of what I think were once the site of some very important ship building yards - now though, there just a rather sad lading dock. When I worked over there I never did manage to penetrate into the church. Is there anything notable inside? The church is close to the old Woolwich Dockyard, which closed in 1869 when warships got too big for it. Quite a lot still survives, including a nice Georgian house with a clock on top and a couple of dry docks, rather ironically filled with water so kids can practice canoeing in them. Nothing much inside the church, though the churchyard has another important monument, a cast iron tomb to Henry Maudsley's wife. I also am related to Robert Coombes via his brother Thomas who was Robert's cox on many occassions (as per Bells Life). Many years ago I was in contact with Alison Gibbens but lost contact. Can you pass this on to her please. In 1976 I took a photo of the memorial which still had one head in place.. I have never heard that the heads were a likeness to Robert. Does anyone know where the "prizes" that Robert won are held" He died in 1860 leaving his family destitute. He had been a somewhat successful businessman (pub owner and boat builder) until he was defrauded by an associate. His son became a Doggett Coat and Badge winner a few years later. Alison - if you see this, could you get in touch? I have lost your email address.